What Is a Travel Trailer? A travel trailer is the most common type of RV and comes in a wide array of different types, styles, and sizes. The wide variety of travel trailers allows for people of different lifestyles to find the right type of travel trailer to suit their needs. Travel trailers are essentially compact homes that you can tow behind your personal vehicle. Of course, you need to ensure your personal vehicle has the towing capacity to carry the specific travel trailer you choose. For example, your 2-door sports car certainly isn’t going to cut it when it comes to any type of travel trailer. Meanwhile, a sturdy 4-door off-road vehicle offers a much better option when it comes to towing capacity. Basically, if your car, SUV, or truck comes with a trailer hitch option, then it should be able to at least tow one of the smaller travel trailer options. How Large Are the Travel Trailers? 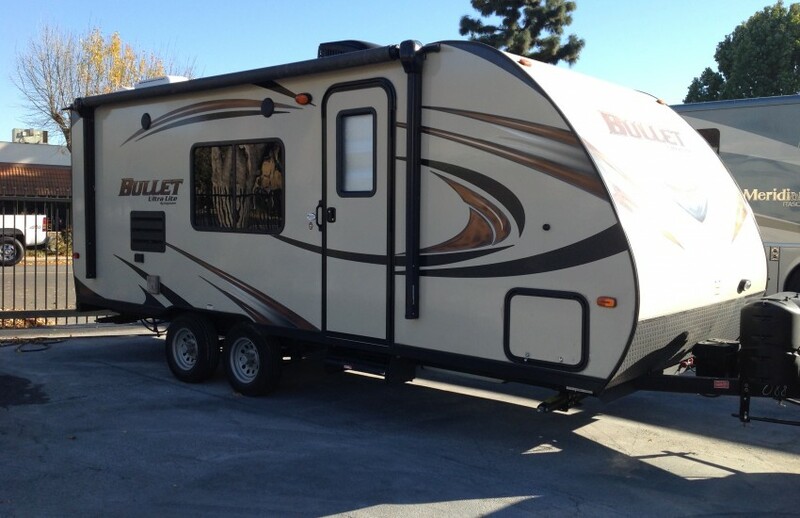 As said, travel trailers come in a wide range of sizes and styles. With that said, most travel trailers typically range anywhere from 12 feet to 35 feet long. A simple, 12-foot travel trailer allows enough comfortable space for one or two people (most likely a couple). Meanwhile, a 35-foot trailer allows enough space for up to 10 people. It might be a bit of a tight squeeze, but those 10 people will have enough room to sleep comfortably. Perhaps the primary benefit offered by travel trailers is the fact that they are much less expensive than motorhomes. A cheap travel trailer can be bought for anywhere around $10,000 to $18,000 while a cheap motorhome would go for at least 3 or 4 times as much. While it will take some time to get used to driving with a big trailer hitched to your vehicle, a travel trailer will also end up allowing you to have greater convenience. This is because you can unhitch your travel trailer at the camping grounds and drive your personal vehicle into the town or city without having to worry about parking a giant motorhome. Of course, you’ll want to ensure that your travel trailer has high-quality locks and security to make sure nothing happens while you leave it at the camping ground. These security measures aren’t aimed purely at thieves, they’re also used to keep pesky raccoons or even bears out of your trailer. Typically, the best precaution to take is to have one person go into town for the supply run and the other person staying back at the trailer. If you’re traveling with the whole family or a large group, you can have two or more people run into town while the rest stay back at the trailer. When it comes to travel trailers, you’re going to find there are 3 main types: folding travel trailers (also known as “pop-up campers”), RV travel trailers, and fifth-wheel travel trailers. Each of these options has its own advantages and disadvantages. The folding travel trailers, for instance, are extremely convenient and the most affordable. However, they’re also typically the smallest and offer the least number of amenities. Meanwhile, a regular RV travel trailer is most similar to a motorhome and can sleep up to 8 people. These trailers offer a lot of space and comfort. They are more expensive than folding travel trailers and they also require a stronger vehicle that can tow a heavier load. A special trailer hitch is also required for your vehicle so it can control the sway of the trailer while you drive. Last but not least, the fifth-wheel travel trailer. This is typically the largest of the 3 travel trailer options. These can sleep up to 10 people and provide a lot of comfort and luxury when it comes to living and sleeping spaces. These travel trailers don’t come cheap and they require a large vehicle to haul them. You’re gonna need a sturdy, full-sized pickup truck to haul this rig. If you have any further questions, feel free to contact our RV and travel trailer experts here!